Along with the other myriad types of publications you can create in MS Publisher, you can make pizza menus to suit any requirement you may have. 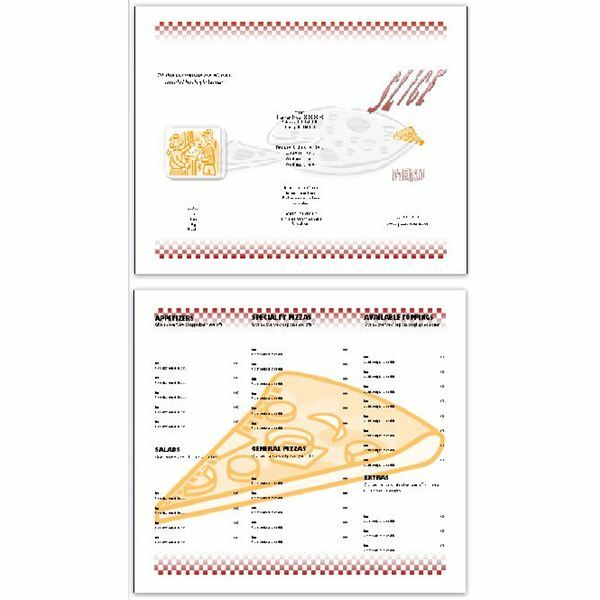 Whether you want to print up affordable takeout menus to mail to customers in your delivery area, you need them for a fun class project or you want a fun idea for serving dinner at home, these pizza menu templates are completely customizable. Change the color scheme, apply new fonts and otherwise modify a template so that your menu looks precisely the way you want it to. 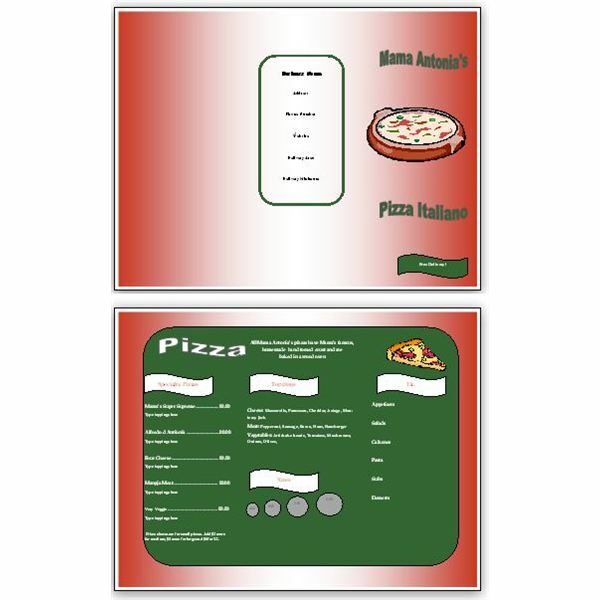 The first of the pizza menu templates is for a trifold menu with backgrounds, text and images on the front and the back. The first panel of the front of the menu uses word art to announce the restaurant’s name. There is a table in which you can place your restaurant’s contact information on the middle exterior panel. Inside there are columns for various menu items and prices as well as eye-catching shapes and images. A great way to interest new customers or encourage repeat customers to order a pie more frequently is by advertising a daily special. This daily specials pizza menu template does just that. 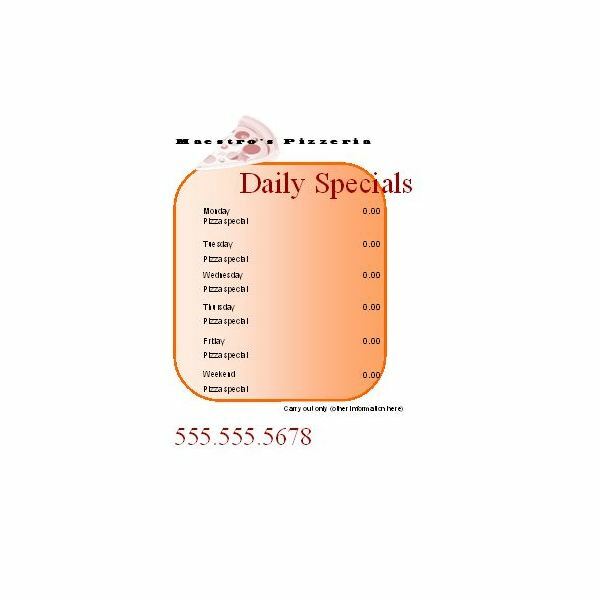 Printing two to a page, the menu simply states your restaurant name and phone number along with a table displaying each day of the week (with Saturday and Sunday compressed), that days special pizza and the price. This double-sided menu template is ideal to hand out to customers who visit your restaurant, mail to customers in your area or pass out door-to-door. The outer panels advertise your restaurant name, address and phone number, provide a map of your delivery area and give other pertinent details such as delivery charges and hours of operation. Inside is a complete menu on a page with a red checkered border and a large slice of pizza in the background of the page. Coupons are a beneficial way to urge residents within your delivery or dine-in area to come and check out your pizzeria. 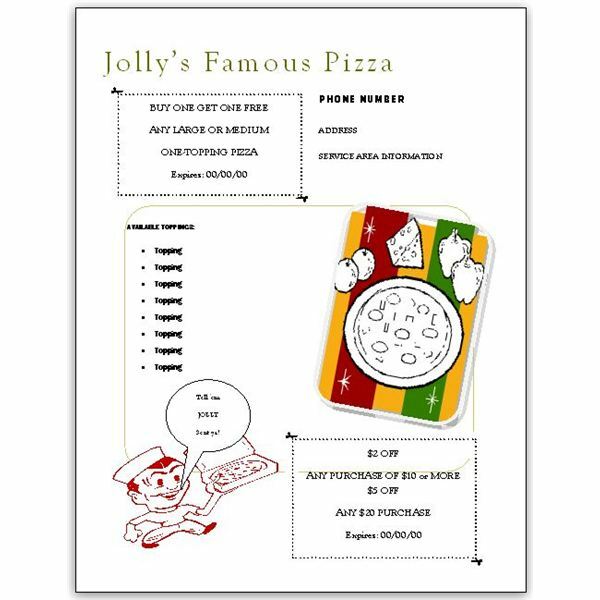 The last in this collection of pizza menu templates is a bright, bold flyer with two money-saving coupons for customers to clip out. Along with the coupons, this menu enables you to list pizza toppings or a handful of your best selling pizza. Of course, it also has places to include your pizza restaurant name, address and phone number. Customize it by adding your own images, tagline or any other details you would like to include. This menu template prints one to a page.